Downtown Disney (soon to be known as Disney Springs) is a lot like the WDW version of “Rick’s”. It seems no matter what theme park you came to visit, or how many souvenirs you’ve bought or your kids have talked you into buying, you always wind up there. Not that that is a bad thing. Even though at its essence it’s a collection of stores and restaurants, there is something distinctly Disney in mood and atmosphere that makes it a place you keep wanting to come back to. Got a taste for Cuban food? Check. Bongo’s it is. Want to hear some blues music? Check. Want to rent a boat and hit the water for sunset? Check. Want to ride a hot air balloon? Covered. Sensing a theme? 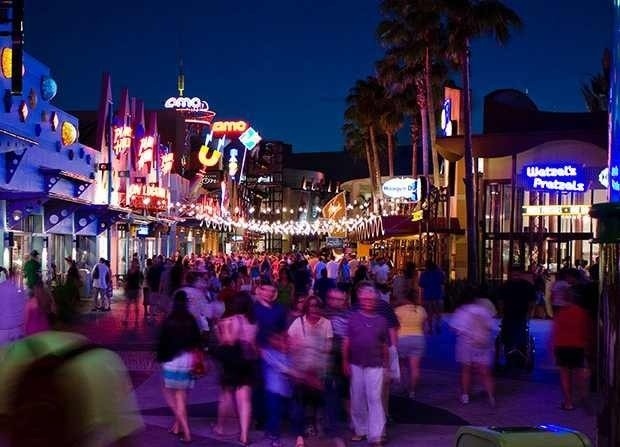 Downtown Disney is an attraction in and of itself. Like most men, I hate shopping. Would rather walk over hot coals barefoot in shackles than go to the mall. But let Downtown Disney get mentioned and I’m grabbing the car keys. Even my kids recognize this intrinsic weakness on my part as a chance to load up on loot. They know that for whatever reason, I can’t seem to say no, like I’m a kid myself in charge of the community wallet. That last part may be an exaggeration, but my family and I do really like going. It’s a vacation tradition on those evenings when the heat of the day has passed to go sit and have an ice cream from Ghiradelli’s and feel the breeze off the water. If we get there and want something more savory than sweet, a good go-to place is Raglan Road for Fish and Chips and a cold drink. On a recent trip, we got try another great place: Babycakes NYC Cupcakes. It’s tucked away inside the Pollo Campero. So easy to miss, but oh what a find. If you happen to be vegan, or have gluten allergies, or want to avoid sugar, this is your Shangri-La. I don’t do any of the above, and still thought the cupcakes were excellent. This barely scratches the surface on what you can find to do at Downtown Disney, and we haven’t even gone into what is coming with the new Disney Springs renovations. We’ll save that for a future post, and if you enjoyed this article, please share it with your friends by hitting one of the Social Media buttons below! What do you like to do at Downtown Disney? Leave a comment in the box! I love hearing from you all! I absolutley agree with you about Downtown Disney. I didn’t know it is soon to be renamed yet again to Disney Springs. It is a regular part of our Disney vacation. I would like to name a couple of my favorite stops there. One is Wolfgang Pucks Express and the other is The Basin . Thanks again for your inciteful and informative blog.I enjoy each one. I waited in line for 30 minutes at the Haagen Daz shop and got the best butter pecan of my life in a freshly made waffle cone! Did I mention that I’m lactose intolerant?